Alright so, my two weeks of crap are almost done (meaning I’ll be able to actually post again...). Sorry for the big delay between posts, like I said in my last post, I’m very busy at the moment. Whatever. Last Friday (25th), I went to Deadmau5 and it was amazing. Anyone who gets the chance to go to his show needs to go. Come early because it ends early (I didn’t know that and I missed the beginning of Deadmau5). The opening set is done by BURNS; I heard he was good... but I don’t know, I wasn’t there yet. Deadmau5 played pretty much everything the crowd wanted to hear, like his unreleased tracks: Catbread, You need a ladder and To play us out. These are my three personal favourite. If you think that Deadmau5 is too “soft” for you, then go at a show and you’ll see it isn’t. The big speakers will make the difference. If you’re still not sure, go listen to his latest mixes and you’ll see he’s that great. BLAST IT, PLAY IT LOUD, DO IT NOW. Like all of you know, his new album has been out for about a week. For Lack of a Better Name is worth the 14$ on Beatport or wherever. I would recommend you buy it now, and for a deeper review, go check my old post on it here. There is also a link to a mix (it’s not the best, but it’s alright). Since you cannot buy the unreleased tracks, I’m going to post these goodies. They are totally amazing. There is only Catbread that is the original mix; the others are rips from Electric Zoo. And YES it has the Zelda intro (in You Need a Ladder). Enjoy, and don’t forget: It’s more than a feeling. Haha. I cannot post anything from his new album, it'll get deleted and I'll get in trouble. Where are you my little heatsource. 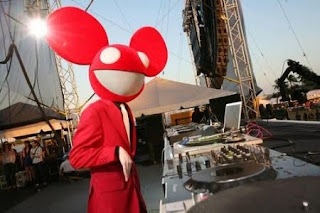 This entry was posted on Thursday, October 1, 2009 and is filed under Deadmau5. You can follow any responses to this entry through the RSS 2.0. You can leave a response. What the hell is your little heatsource? Oh, and Deadmau5 was only amazing for the people in the crowd. People staring from upstairs are pussies! Bet you don't know who I am. Anonymous? Hell Yeah. Ok, say someone would want to create their own techno from scratch, what computer programs would you suggest? oh sick man, thanks a lot, Ableton works great. Im sure the pros know how to use it better than me though.